The Ellure Plus includes a suite of features for embroiderers and avid sewers. The USB (Type A) port and 5″ X 7″ embroidery field will make your embroidery projects a breeze. And with a variety of decorative stitches and hands-free presser foot lift, the Ellure Plus will make sewing more convenient. 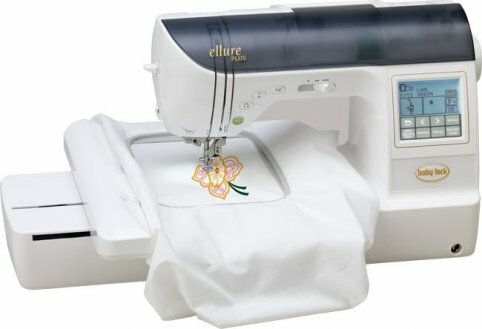 You won’t be able to decide if you love the Ellure Plus for its embroidery or sewing features. It offers 6 embroidery fonts, a 5″ X 12″ multi-position hoop and thumb drive access to your designs. Or will you love its 205 built-in stitches including lateral feeding stitches and an extension table? You’ll have a hard time deciding if it’s your go-to machine for sewing or embroidery. Embroider 6 alphabet styles in your multi-position hoop. Effortlessly raise the presser foot with a tap of the knee, leaving your hands free for control and precision in your sewing. The Ellure Plus has 205 built-in stitches, 3 alphabet styles and lateral feeding.